Samsung issued a firmware update for the Samsung Gear 360 2017 that makes the Gear 360 2017 compatible with the Street View app. A direct connection with the Street View app makes it easier to take photos for Street View using the Gear 360 2017. 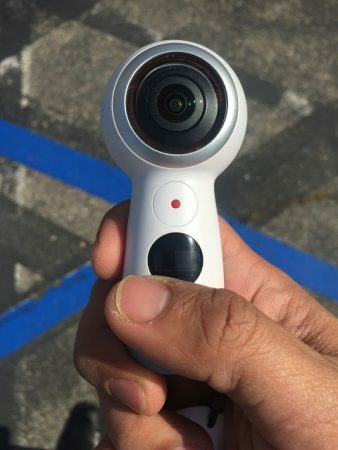 It also enables phones that are not otherwise compatible with Gear 360 2017 to shoot and stitch photos (but not videos) with the Gear 360 2017. 1. connect the Gear 360 2017 to the Gear 360 app. 3. Tap on Firmware version. 4. Tap on Check for Updates. 5. It will tell you a new update is available and allow you to download it. 6. When download is complete, click on Install. 1. Turn on the camera and hold down the menu button. When the Connection options appear, tap on menu button until you select Connect to Street View. Press the camera’s shutter to select it. 2. On your smartphone, connect to the Wi Fi network called Gear 360(####).OSC and enter the password shown on your Gear 360’s LCD. 3. Launch Google Street View app and tap on the camera icon on the bottom right. Select “Link external 360 camera”. When the connection is successful, it will say “Connected to Gear 360”. When you shoot a photo, a stitched photo will be sent to your phone, ready for upload to Street View. The Theta V record videos for Google Streetview. This is great feature and make more easy and fun the mapping for streetview. Gear 360 2017 can do this? How do i use another phone thats not Galaxy with the camera ? Hi Emmanuel. You can use a compatible iPhone, or for any other phone, you can use the street view app to connect to the Gear 360 2017 and shoot and stitch photos (you don’t have to upload the photo to street view). I am trying to connect Street View and the G360. Are you suggesting that first I must open the Street View App and from there connect to the camera? How? Can you post details? Excellent news! Annoying with the 2016 especially for us iPhone users! Street View app continues to crash. My scenario: New Galaxy S9 with Gear 360 2017 camera, updated firmware as described in this article. I am able to connect Street View app on phone to Gear 360 camera and take single shots from Street View app, but when I switch to Interval mode (which is pretty much the only reason to use this app) the app will hard crash when Interval mode is selected. Cleared cache data even proceeded to reinstall Street View app, there is some incompatibility issue, probably with Samsung default settings…. Who knows. Just constant “Street View has stopped working” message when I toggle interval mode…. I have 2 phone (Moto G4Pluc/Androi7,0 – iphone6/ios11.3.1) and gear 360 2017 upgrade to newest formware. GooleStreet view on android can see Gear 360 but it can not preview picture before capture, the screen of GoogleStreet view is white, I just know picture after shooting and stitched photo. With iphone, I can see camera icon at bottom right, so I can not shooting photo. Do you have any recommend for my case?